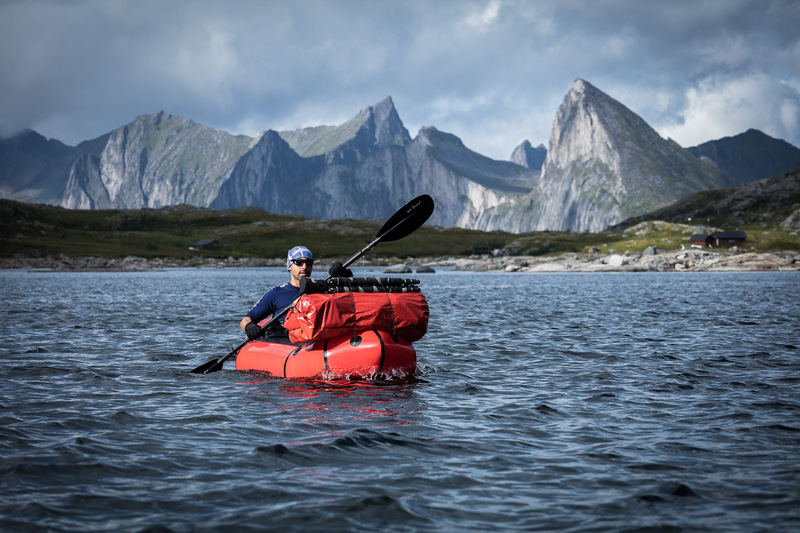 It’s noon on Day 3 of a packrafting route in Senja, Norway, and I’m tent-bound with Harsharn. Wind and rain have been battering the tent for the last 20 hours. Pools have formed around us and a small stream is running under the groundsheet. All we can do is wait it out and be glad that at least we managed to catch up on some sleep! 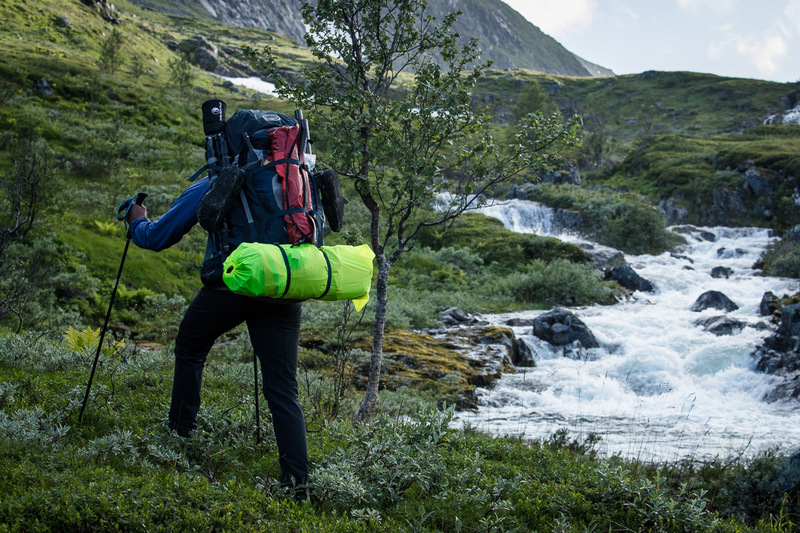 A few months ago, staring at a gap in my calendar, I picked up the phone to Harsharn and suggested packrafting trip in Senja. It was two years since our epic adventure in Greenland and we were overdue another outing on the boats. 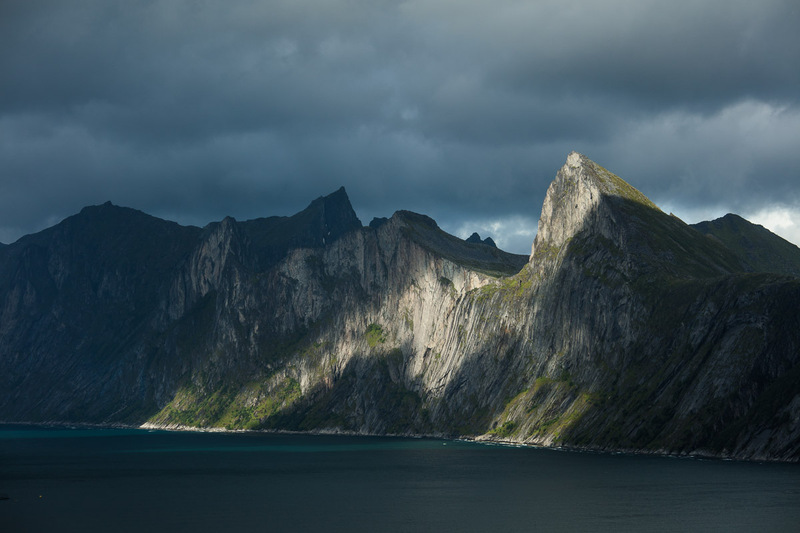 A Google Earth scout of Norway’s mountains and fjords soon had me interested in the island of Senja. 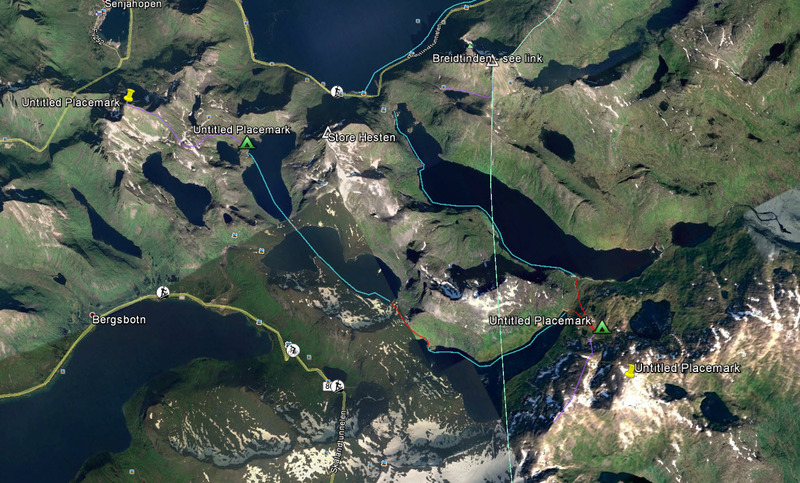 I picked a few potential routes for the boats, eventually settling on a 6 day route combining paddling fjords and lakes with hiking mountains and passes. 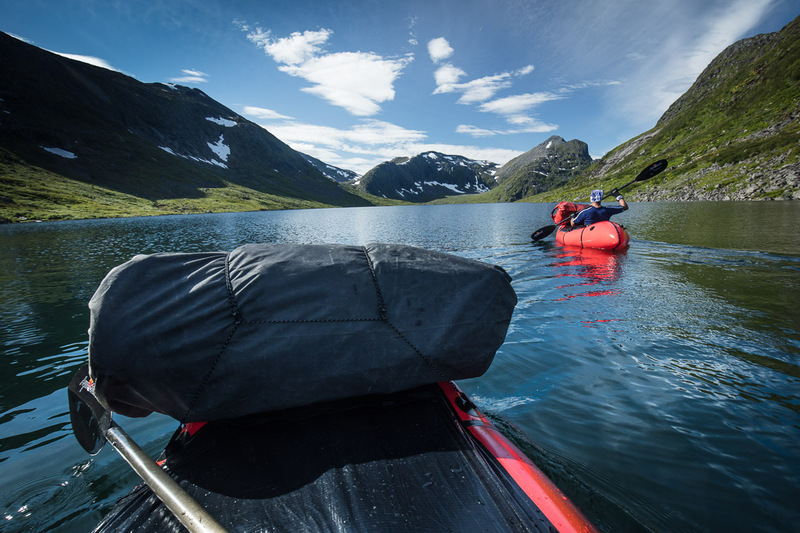 We allowed ourselves 16 days to properly explore the area and provide flexibility to go packrafting during a good weather spell – the boats are pretty susceptible to strong winds. 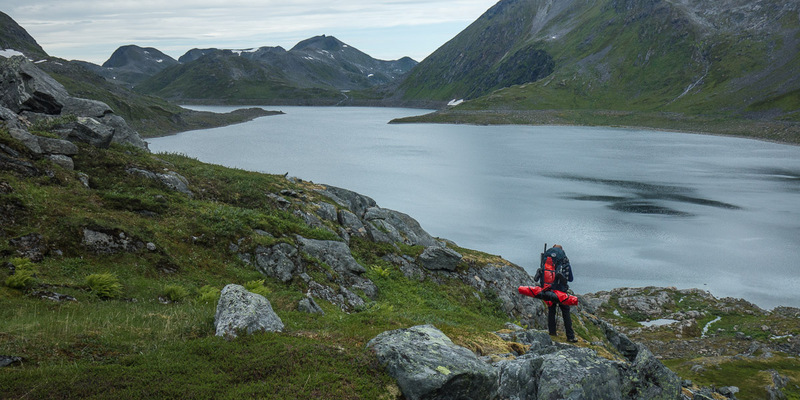 After flying in to Tromso we spend our first night camped at a lake in the Lyngen Alps before moving on to Senja where we initially hiked the peaks of Kongen, Segla and Barden largely in nice weather interspersed with wet and windy spells. Unfortunately after a while it looked like we were never quite going to get the run of weather we would have liked to make the most of the packrafting so we dialled back our ambitions somewhat to make sure we hit good conditions on the most remote portion of the trip. 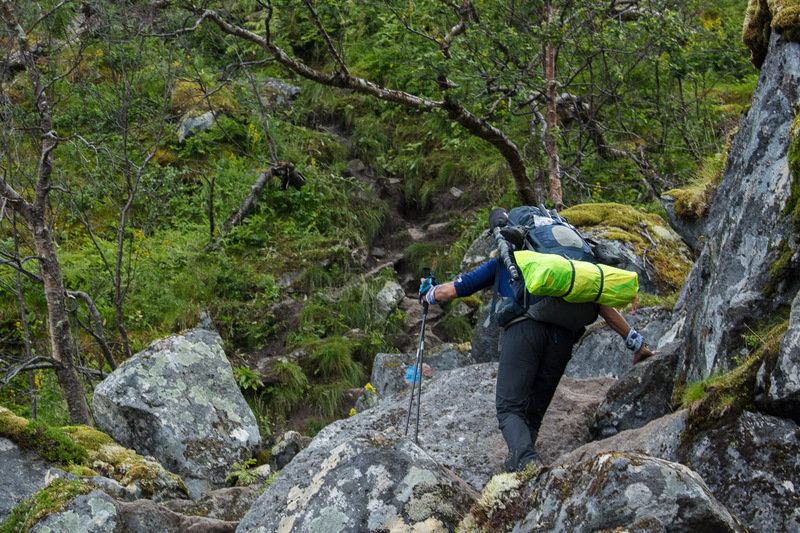 Day 1 started on the trail up to Svartholvatnet a short but steep route through the trees with the odd bit of boulder hopping. 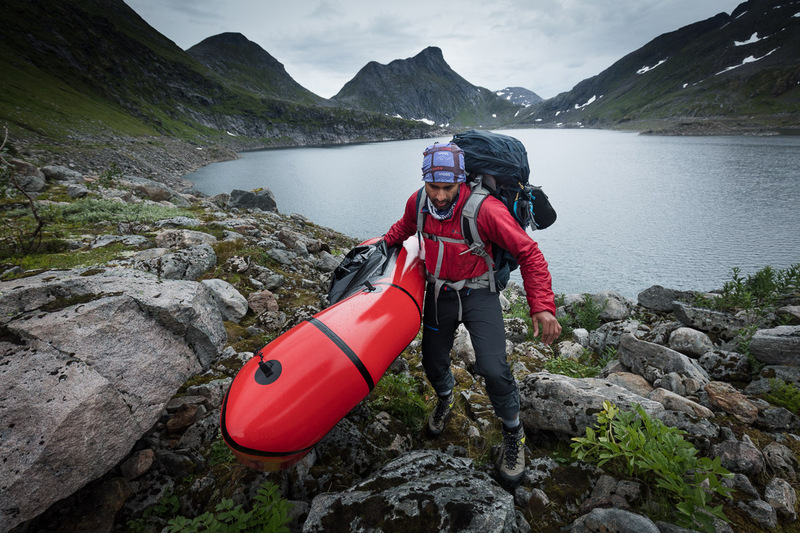 The additional weight of the packrafts brought back unwelcome reminders of our difficulties in Greenland, but we were excited to get on the water once more. 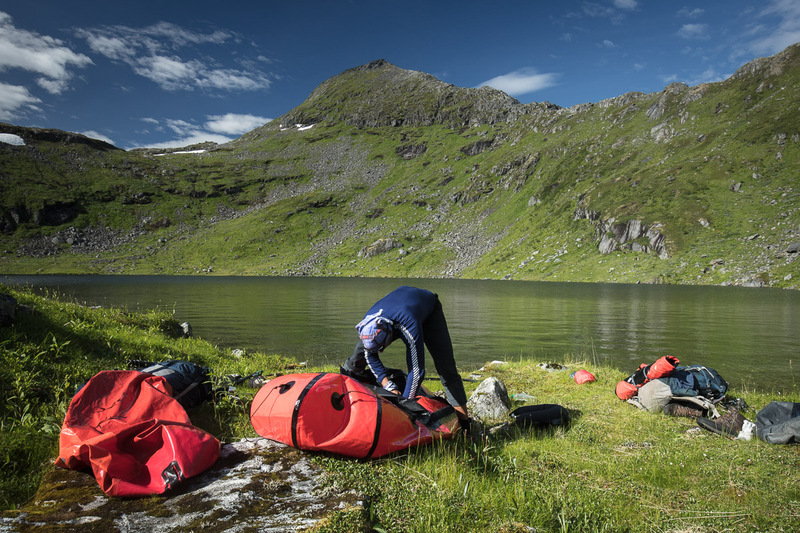 Svartholvatnet was calm as we inflated the boats and began paddling. The heavy clouds that had hung around for the start of our hike began to melt away. We soon found our paddling rhythm. 6km later on the opposite shore we began hiking up the river that formed the outflow of Nedre Hestvatnet. 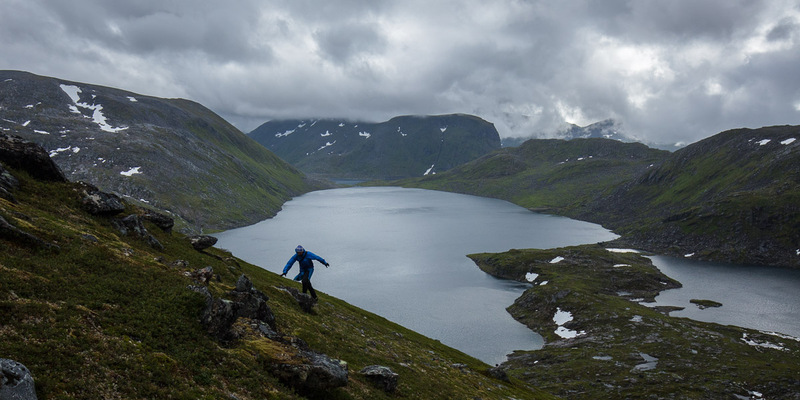 We stashed our boats at the end of the lake and set about trudging upward, hoping to find a route that would lead us up Istindan. The scramble we chose quickly became a little overcommitting. The ground was wet and loose underfoot and the gradient was too steep to be comfortable. Nevertheless we persevered, in part because going down the same way would have been hellish! The ascent was often wet and loose – we would have to find a different way down. At the top of the climb we started looking for a camp spot but it quickly became apparent that camping on the mountain would be almost impossible due to relentless rock outcrops. 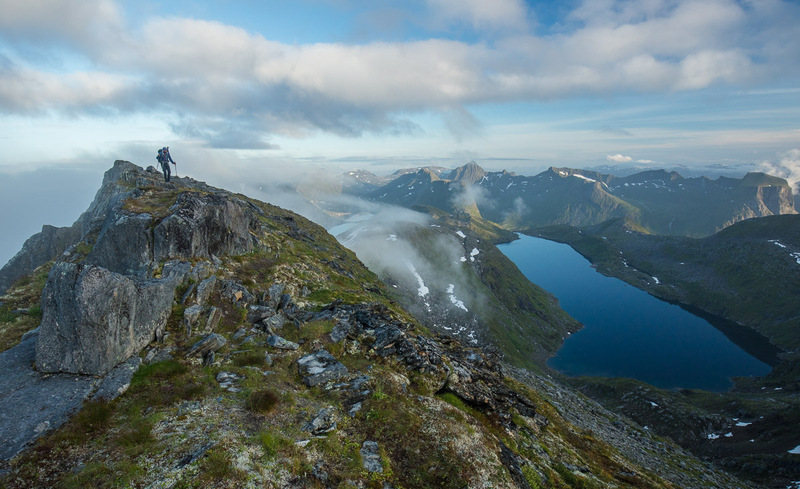 We ended up pitching on an old snow patch with lovely views out over Nedre Hestvatnet and on to Stormoa. Camp for the night. I had a winter mat with me so sleeping on snow wasnt an issue. 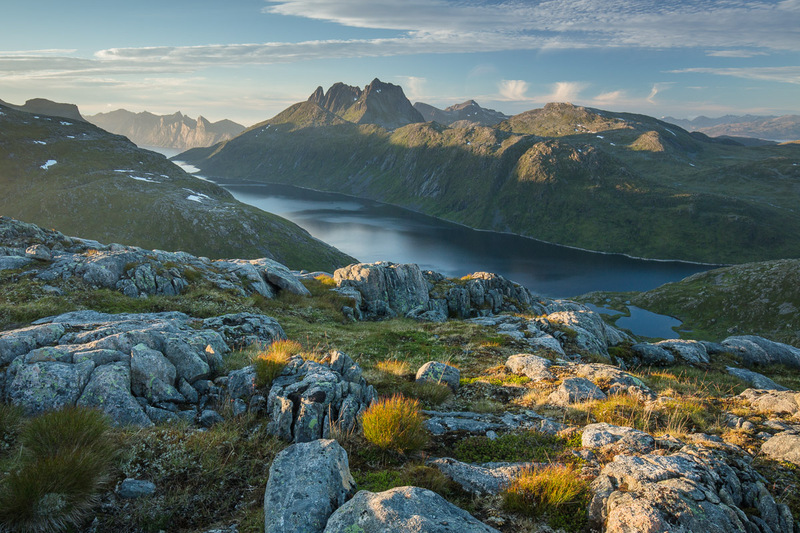 A view to Breidtinden from near our camp. We climbed this peak 5 days later. 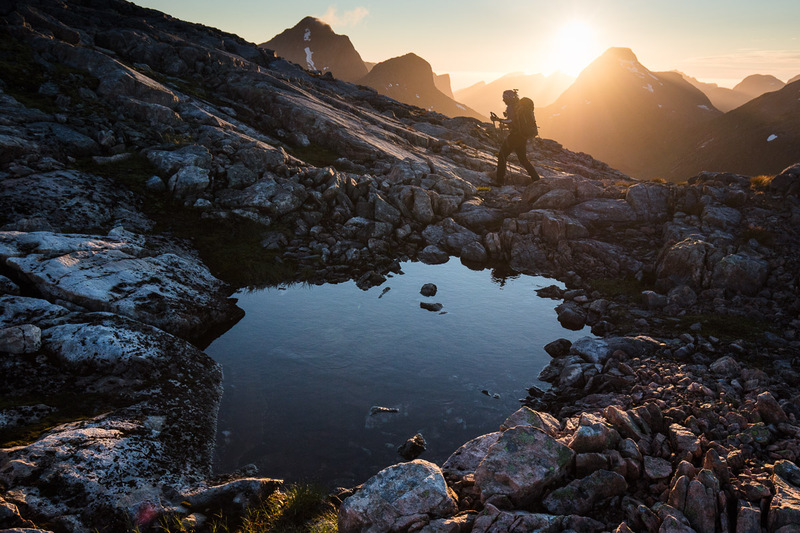 After dinner and with sunset approaching we hiked up towards Istindan, the most remote peak of our trip. 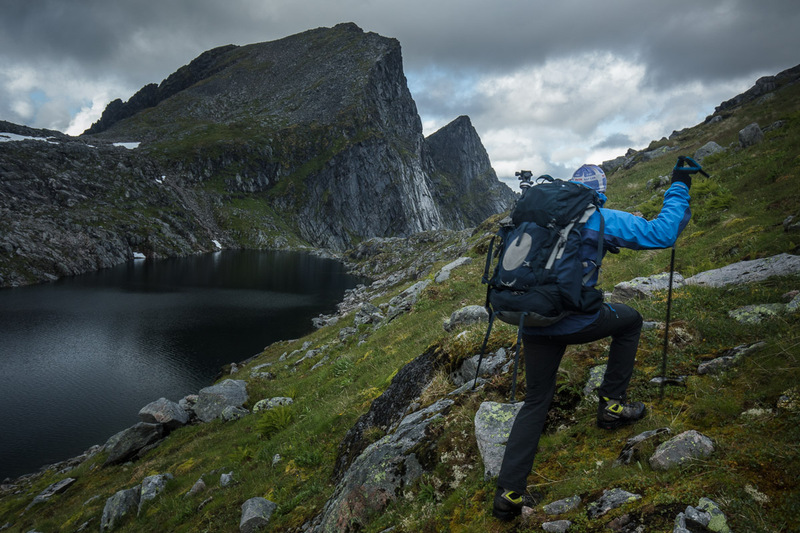 Hiking towards Istindan – there was plenty of foreground interest which made it tempting to stop early! 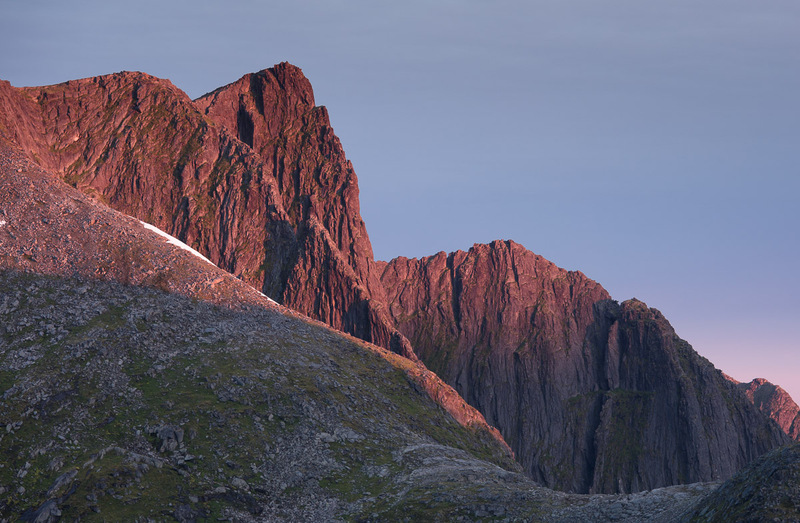 The view from close to the summit was staggering and we were treated to a surprisingly colourful sunset. Sunrise the following day was clear – a non-event, and we went back to sleep confident that we wouldn’t be missing anything. After a breakfast of porridge we packed up and found a different route down following a nearby stream. Once again this proved a little harder than we initially hoped but it was a marked improvement on our ascent route. Still a steep descent but much easier than our chosen route up. We had an early lunch at the shore of the lake before inflating the boats once more. The water was tranquil as we set out but the cirrus overhead indicated a change in the weather. By the time we had reached the end of the lake the water had become agitated and the blue sky had all but disappeared. 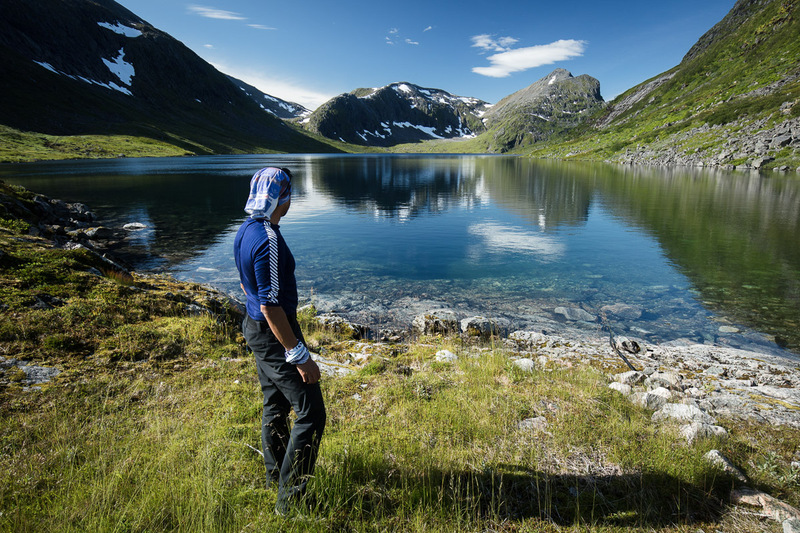 A perfect Norwegian scene awaited us at the shore. Paddling on a calm lake in nice weather is a sheer joy – I must do it more often. Packing up at the end of the lake. Another unknown was the pass between Nedre Hestvatnet and Store Hestvatnet. It did at least look possible on the map, but you never know until you are at the base of a climb just what ‘possible’ really means. Fortunately on this occasion we found the route to be easy enough, climbing through scree and secure vegetation. Lunch on top of the pass. It would have been nice to hang around here, but the weather now seemed like it might turn against us. The second lake of the day was rather disappointing. An old waterline scarred the shoreline suggesting it had been dammed, though we never quite figured out exactly what had happened. Needless to say it lacked the natural lush appearance of the area we had just paddled through and with grey skies overhead it felt a little unwelcoming. Our second lake of the day was, by comparison, somewhat drab. 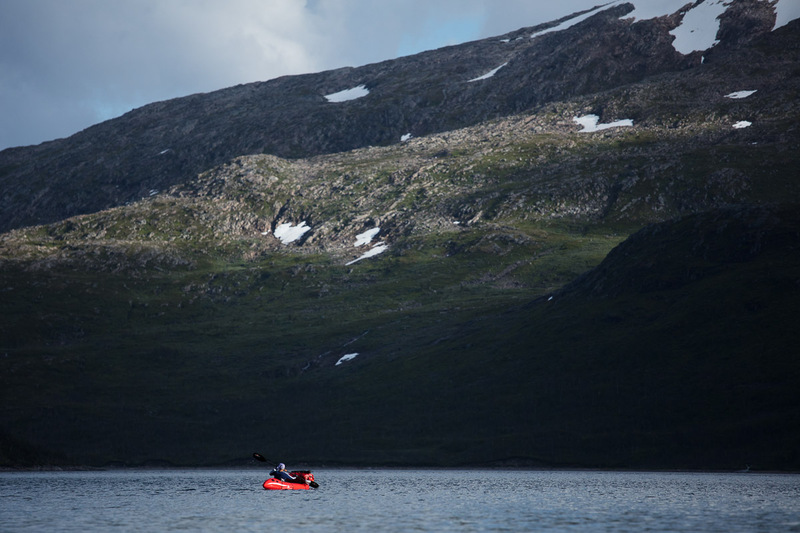 Our final paddle was a short one on Lille Hestvatnet, which we reached after carry the boats up a short ascent between the lakes. It’s actually the first time I have carried my boat more than about 10m when fully inflated. I found it surprisingly easy, so perhaps it’s something to consider for the future. Harsharn carrying his boat – I’m particularly fond of this shot, although I’m not sure why! On the shore of our third and final lake I think we were both aware of the relative pointlessness of paddling just 2km, but we had the boats so it made sense to use them! In no time we had made the crossing and we packed up our boats just as the first rain began to fall. It took some time to find a camp spot. Although the ground was mostly level it was tussocky or rock-strewn to the extent that at one point I wondered if we would find anywhere at all. 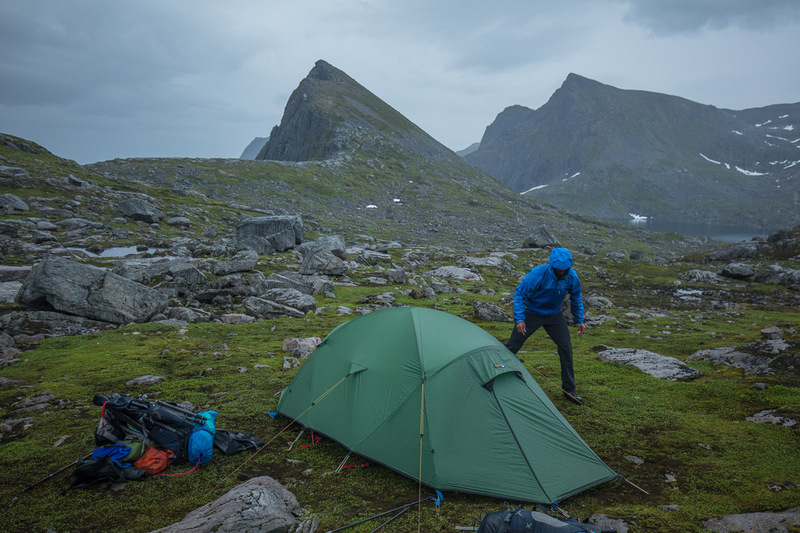 As the intensity of the rain increased I came across a small area of sodden ground – just enough for one tent. 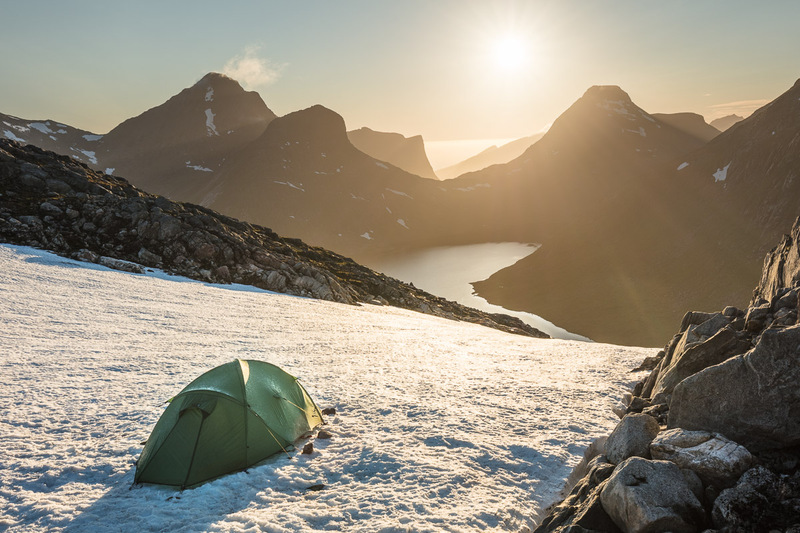 We didn’t leave the tent until the middle of the following afternoon! 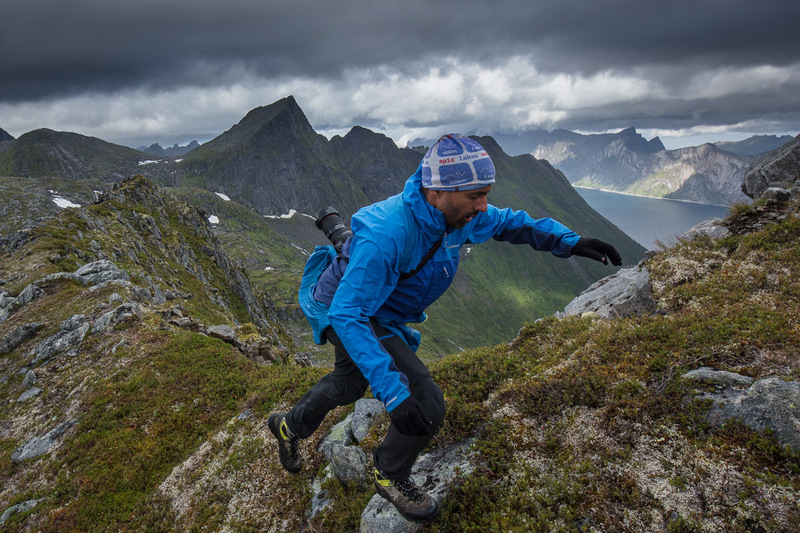 Escape from the tent – time to do some peaks! With the rain gone we had some catching up to do if we were to tackle Litle Hesten, Burstind and Roalden. 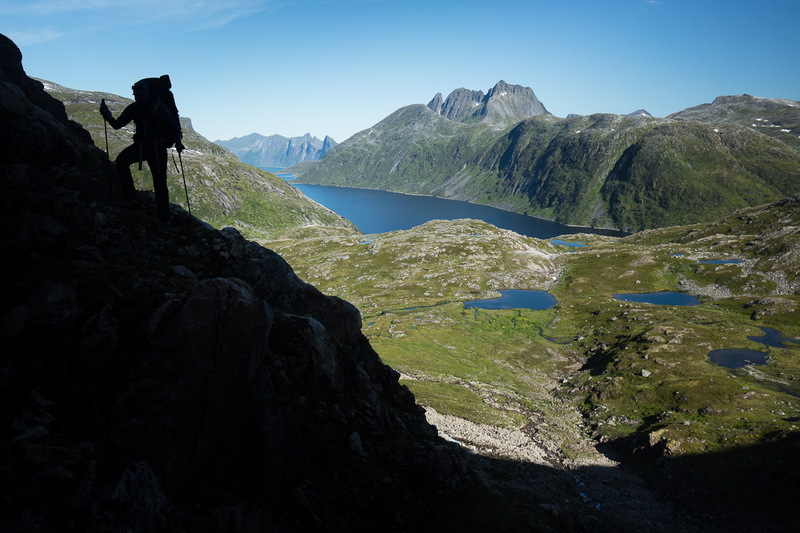 The first peak, Litle Hesten was only a short distance from our tent. The ascent was steep but on generally excellent ground. 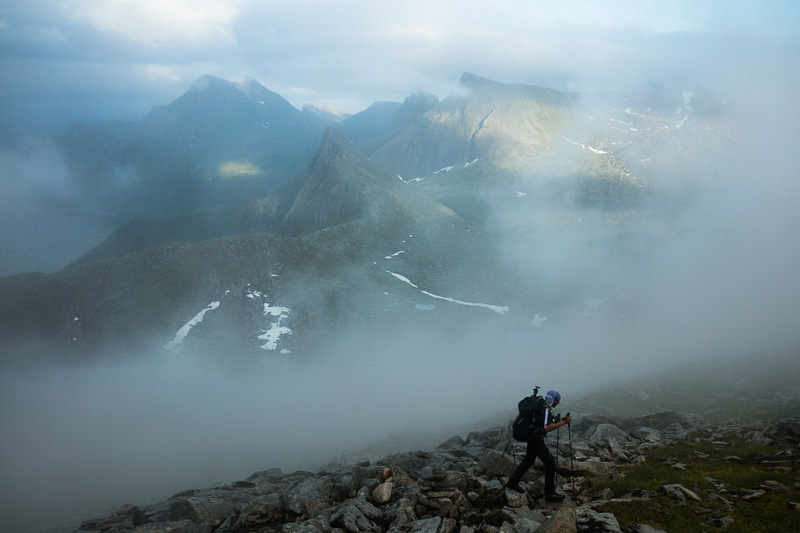 Nearing the top of Litle Hesten – Burstind in the background. A composition I was considering for the following morning, but perhaps this one will do! 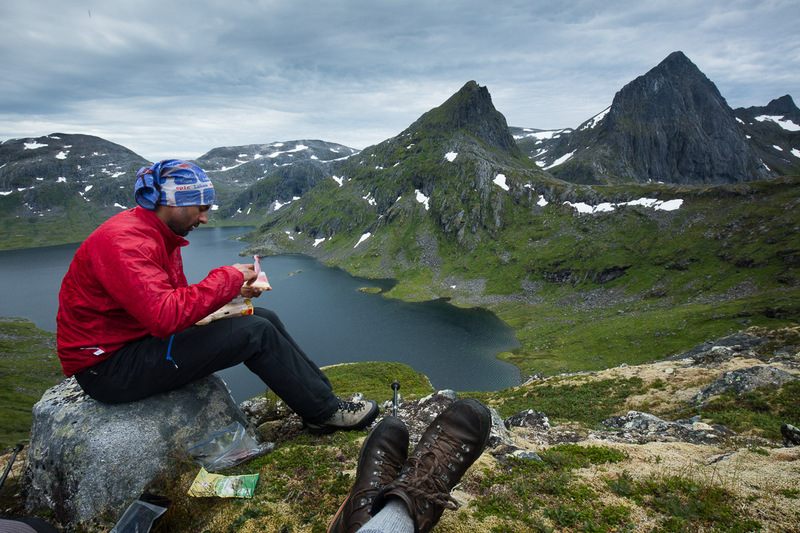 We had a late lunch back at the tent and then continued on to Burstind. The route to the mountain around a small lake was surprisingly awkward but once we were climbing we found it fairly straightforward. On our way to Burstind. The clouds barely lifted through the afternoon but at least it was dry. The summit view from Burstind with a glipse of sunlight. We hung around on the summit of Burstind for some time deciding whether there was any point in heading up Roalden – it was completely enveloped in cloud. Ultimately we decided that photographically there was relatively little to be gained from hanging around, so we headed down to to pick up the path to Roalden. 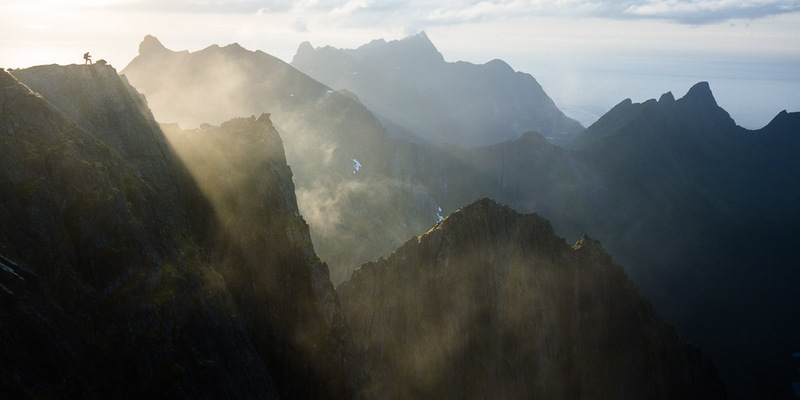 A little bit of hope – the cloud would occasionally break up revealing the landscape below. The route up Roalden was the first path we found on the entire loop (except the first ascent on day 1). In some guides it is marked as a black (difficult) route, but really its pretty trivial with minimal exposure. The path is really just a series of painted rocks indicating the best route, but it is clearly marked and easily followed. As we climbed higher the cloud that had shrouded the peak broke up until eventually we had a completely clear view. Of course as sunset approached the clouds all but disappeared and we were left with somewhat boring light to work with. Still, it was a magical place to be and a deserved end to the days hike. The faces of Roalden are unquestionably spectacular. There would be some excellent opportunities here at sunrise. Sunset from Roalden looking south. 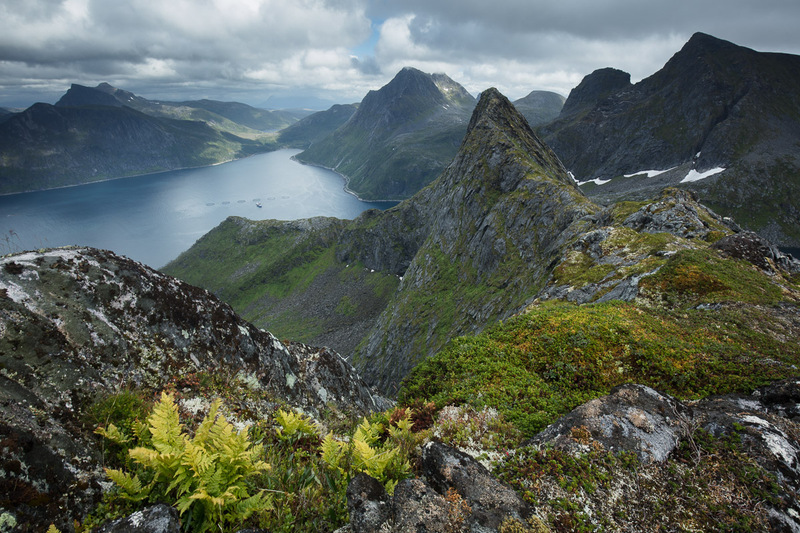 The route back to the tent (which was roughly in the center of the above image) was again awkward over steep ground but we were back long before headtorches would have been required – one of the benefits of hiking this far north. The following morning we awoke to an early alarm and thick clouds overhead. With a tiny gap visible on the horizon we felt it was worth a gamble and ascended Litle Hesten as we had done the day before. By the time we were on top the cloud had thinned substantially and the gap closed further. Unfortunately my hopes for a final spectacular scene weren’t quite realised, but it was well worth the trip. 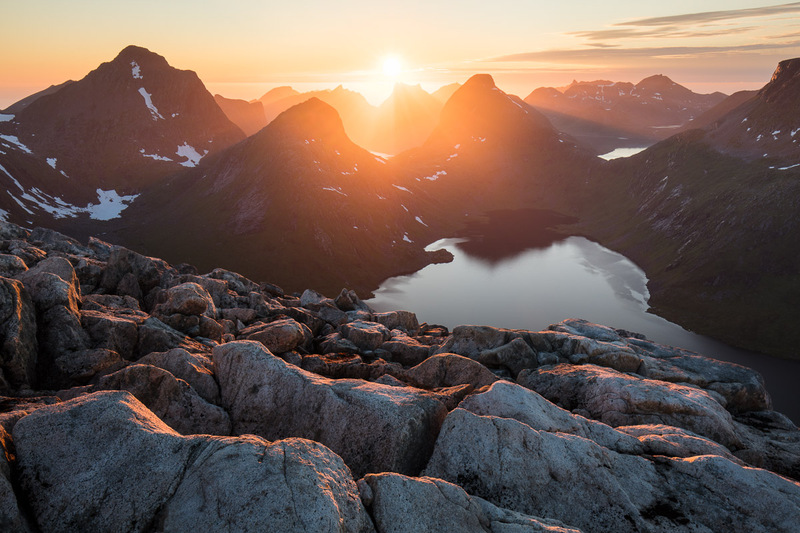 Direct sunlight on Roalden as seen from Litle Hesten. 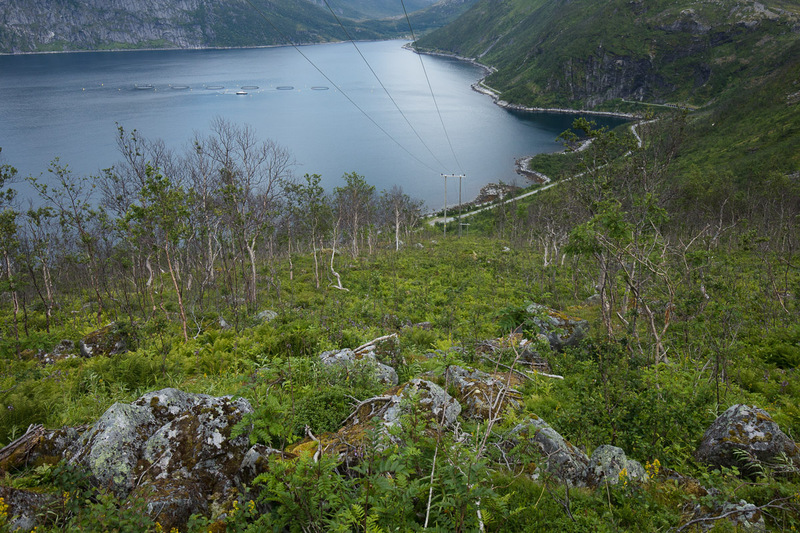 Later that morning, after a few more hours sleep we headed back down to the fjord following some pylons. Somewhat typically we saved the worst part of the route for last. 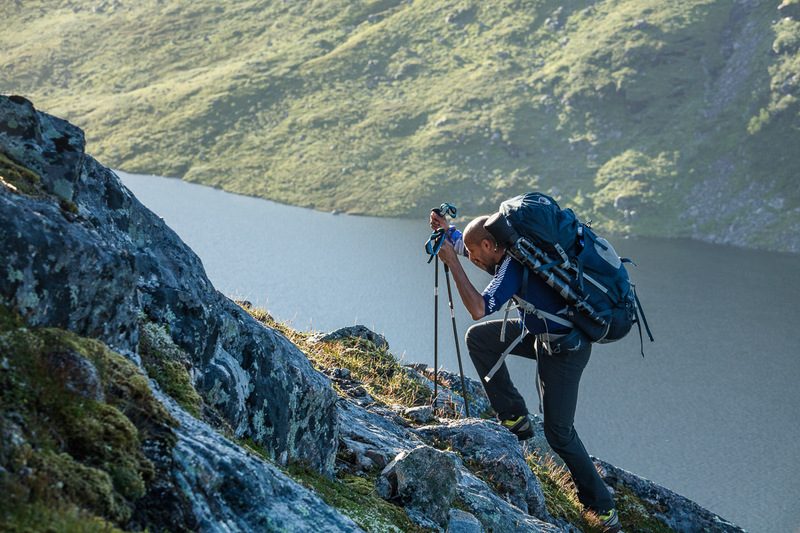 The final descent was through thick vegetation with endless unseen trip and fall hazards. The descent looked easy from the bottom, but once we were on it we wished there was another way! All in all it was a great mini adventure, only slightly spoiled by the extended period in the tent. 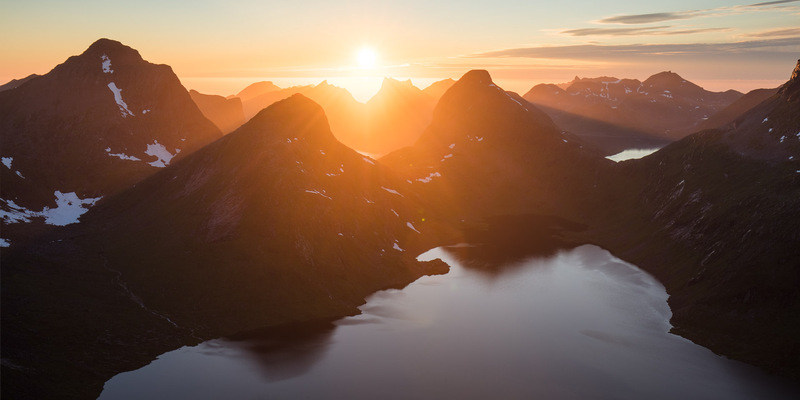 It was great to have a plan come off in the way it did with the sunset from Istindan a particular highlight – it’s an image that would be hard to replicate given the access difficulties. Written by alexnail, posted on 30th August 2017 at 6:48 pm, in Trip Reports. Permalink. RSS feed for this post. Sounds like you both had a great time and the photos and write up should be sent to one of these outdoor mag’s. Great work. Great little trip report, Alex. Cool to read about these adventures halfway around the world from me. Great trip report full of photos and hardships 🙂 Enjoyed your photos, Alex.